This Cheesecake Milkshake uses an easy cheesecake base that you cook quickly in the microwave. Then you blend it with ice cream, milk and a graham cracker for the crust flavor. It’s like a piece of New York-style cheesecake in a glass. Did you know that the very first milkshake was made in a drugstore? It’s actually not so crazy if you remember that drug stores used to have soda fountains (a bar with a man in an apron making fountain drinks and stools full of people drinking them). 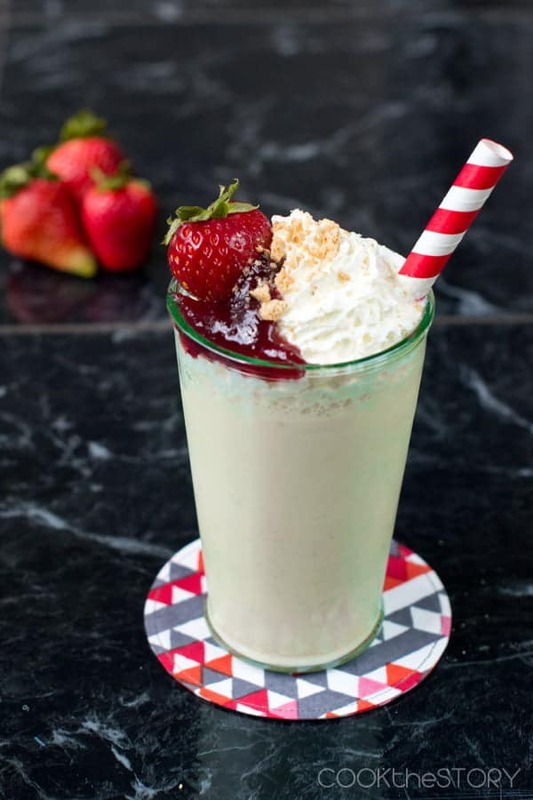 Nowadays, everybody knows what a milkshake is and has opinions about how thick it should be, as well as whether one should stick with traditional flavors or try something new. I’m a try-something-new kind of girl which is why I was super-excited to join up with Julie from The Little Kitchen and Lindsay from Love and Olive Oil and a bunch of other bloggers to throw a #milkshakeweek. Head over to Julie’s or Lindsay‘s Milkshake Week kick-off posts to check out their amazing milkshake giveaways. 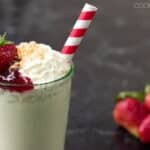 And scroll down to the bottom of this post to see all the creative and delicious shakes that the bloggers have come up with today. With milkshakes being such a popular drink, it’s hardly surprising that so many different flavors have sprung up over the years. For #milkshakeweek I wanted to come up with a milkshake that nobody has ever made before. But everything I searched for online has already been done. Crazy, right? I decided to go with one of my favorite milkshakes that I’ve been making for years. A Cheesecake Milkshake. Except normally I just add cream cheese to the ice cream and milk. This time I went over the top and made an easy cheesecake base that you quickly cook in the microwave. (If your brain just went, “Microwaved cheesecake? Does that mean that I can have a cheesecake anytime I want, ready in minutes?” The answer is yes. Check out this microwaved cheesecake, complete with crust, over at Kirbie’s Cravings). That cheesecake base, if you don’t eat it straight out of the microwave (which is totally what I did the first time I made it), goes into a blender with ice cream, milk and a graham cracker. Then you blend it up, pour into a tall glass and top it with whipped cream, warmed up strawberry jam and a strawberry. It tastes just like a slice of New York-style cheesecake, in a glass. 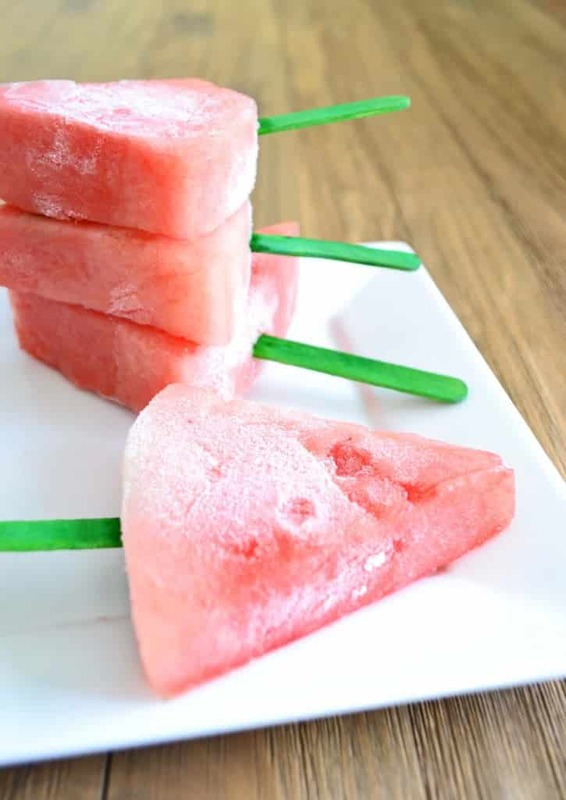 Oh, and if you’re looking for another quick, kid-friendly, summer dessert, be sure to also check out my recipe for frozen watermelon. It’s the easiest popsicle ever! 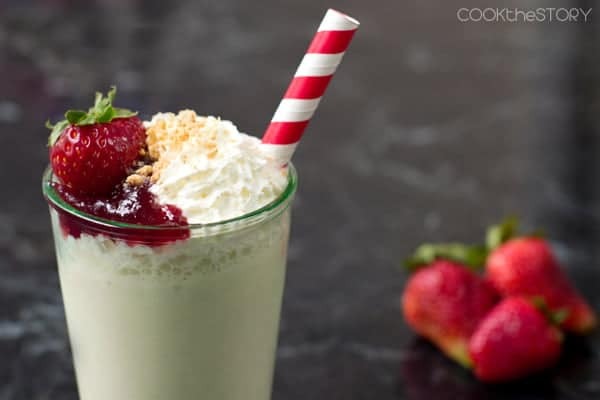 And now, here’s my Cheesecake Milkshake recipe. This Cheesecake Milkshake tastes like a slice of New York Style Cheesecake in a glass. For best results, let the cheesecake base chill after cooking. But if you're in a hurry, stick it in the freezer for a couple of minutes to get it down to room temperature. 1 sheet graham crackers (i.e., four connected crackers. Please do not misread sheet for sleeve. You do not need a whole sleeve of crackers. Just one little sheet of 4 connected crackers). In a small microwave-safe bowl use a fork to whisk together the cream cheese, Greek yogurt, sugar, egg, vanilla and pinch of salt. Try to get most of the lumps of cream cheese smooth but it's OK if some remains. Cover it with plastic wrap, leaving a small gap for steam to escape, and microwave on high for 1 minute. Then microwave for 20 seconds at a time until the center is mostly cooked. It can still jiggle a little. Remove from microwave and let it cool. Meanwhile, put the jam in a small microwave-safe bowl and warm it for 15 seconds or so. Stir in the water. Set aside. Into the blender, put the ice cream, milk, 1/2 of the sheet of graham crackers and your cheesecake base. Blend. Pour it into a glass. Top with the whipped cream and then drizzle with the strawberry jam. Crumble your remaining half sheet of crackers over top. Plop on the strawberry. Drink! *The info about the first milkshake is from Hankering for History here. 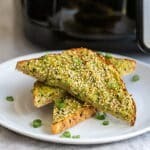 I was wondering if there’s any alternative for egg in this recipe? I’d love to try it ! This recipe is crap!! It was pure liquid, not a milkshake at all! I’m sorry you had trouble with this recipe. Did you cook the cheesecake portion in the microwave until the middle was mostly set (as instructed in step 2) before making the milkshake? This sounds delicious!! I am adding this to my to-do list today! Yummo!! Seriously, Christine, the photos are beautiful!! And I love love the idea of a cheesecake milkshake! Oh my. Now if I can just figure out how to make this dairy free.. LOL.. 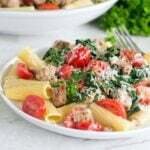 I am so excited that I have everything to make this in my fridge right now! Seriously, this sounds beyond delicious. But, cheesecake anytime via the microwave? I’m in trouble. So, now I’m craving a cheesecake milkshake for breakfast! This looks delicious! Yum, this looks like a fantastic milkshake :) I love cheesecake and what better way to have it than in this form!! Oh my! That milkshake looks AMAZING! And that straw? Gorgeous! You and all the other delicious milkshake makers should be banned from the net! Pushing addictive substances! I rarely have a milk shake, but they could truly be a downfall. I suppose the yogurt is to make us feel a bit virtuous. Well any excuse in a storm—-my version of that saying. Ha! Of course I pinned it. This sounds Amazing! I love cheesecake and to have it in a shake makes it even better. I can’t wait to try this recipe. Thank you! I’m all about cheesecake that you can drink. wow looks delicious! 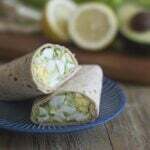 love this recipe – and what a great flavour combination! thanks for the inspiration. Yes, mind is blown that you can make a microwave cheesecake. I’m in trouble or should I say my waist-line! 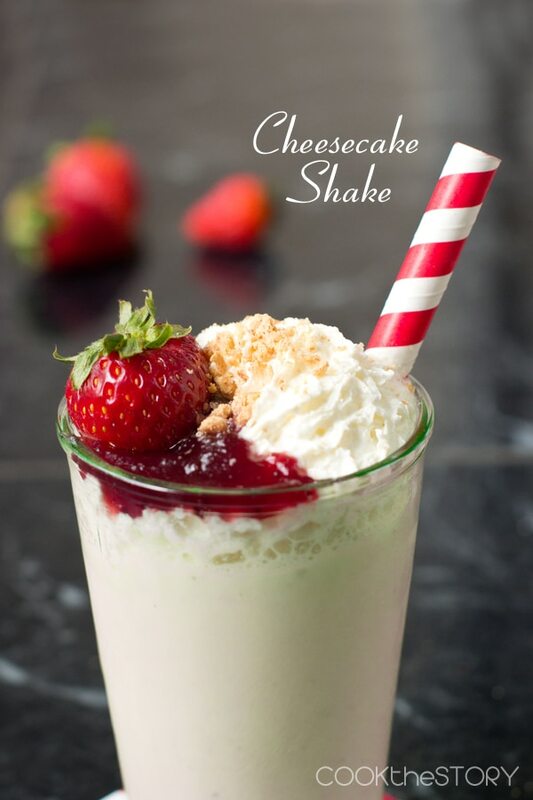 I LOVE cheesecake–by far my favorite dessert so to put it into a milkshake… I’m in heaven! You had me at milkshake or was it cheesecake? OMG mind blown! Wow. Just wow. I bet this tastes amazing! Oh wow! Love this idea! Good gosh, Christine, does that ever look fantastic! I have such a weakness for cheesecake! I need to forget immediately that I can make cheesecake in the microwave. ;) This milkshake looks incredible. I love the dollop of jam – so easy! You are a genius!! Cheesecake milkshake. I need this in my life! You just blew my mind! I can’t wait to try this wonderful concoction! WOW. That’s all I can say. What a decadent treat! I feel like I can’t even breather right now. This sounds SO good!! Oh my Christine. My husband would go nuts over this milkshake. Pinned.